Another confirmation that Salesforce.com bought Work.com domain name. In March I put together a fairly convincing argument that Salesforce.com had purchased Work.com. In March I wrote about how all signs pointed to Salesforce having purchased the domain name. The whois record and brand protection company to whom the domain was registered was the same as Site.com, which Salesforce.com recently purchased. Work.com had also been listed in a Moniker auction, and Salesforce has purchased multiple names through Moniker including Data.com. I happened to check the Work.com nameservers today when I noticed that Saleforce.com acquired another domain, GovernmentCloud.com, using the same brand protection service. Will Work.com be for Salesforce’s push into the human resources market? We’ll have to see. Salesforce.com loses dispute over Forces.com domain name at National Arbitration Forum. Salesforce.com has lost an attempt to get the domain name Forces.com, which it said was similar to its Force.com domain name. The registrant’s predecessor had registered the domain name before Salesforce.com started using the Force.com domain name. As Elliot Silver pointed out when the case was filed, the domain name also had a page about the armed forces. A three member National Arbitration Forum panel found that the domain name was not confusingly similar to a mark in which Salesforce.com had rights. Forces.com owner Internet Venture Holdings, Inc. was represented by John Berryhill. I find this UDRP filing rather interesting since the company is savvy about the value of generic domain names. It purchased Data.com for $4.5 million and also owns Social.com (the sales price on Social.com was likely at least $2.6 million since a party bought it at auction for that much). Salesforce.com CEO Marc Benioff even sold the domain name Bill.com. For a company savvy about great generic domain names, why would it take this approach for Forces.com? Financial report mentions sale of “portfolio” of domains for $4.5 million. 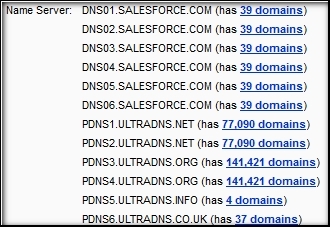 We basically already knew that Salesforce.com paid $4.5 million for the domain name Data.com. But if you’re looking for a little bit more proof of the transaction price, you’ll find it in the seller’s 2011 first half financial report. On 2 June 2011, the Group sold a portfolio of domain names for total consideration of $4.5m (£2.8m). Profit after directly attributable costs of £2.5m was recognised on disposal. The sale of Data.com was completed in the first week of June. I find it interesting that the company refers to this as a “portfolio of domain names”, which means that more than just Data.com changed hands. But any other domains sold have negligible value compared to Data.com. According to Fusible.com, Salesforce was also the $2.6 million buyer of Social.com, which was listed at the same Moniker auction. I’m surprised about this given what I had heard about the buyer. But that would mean the company spent $7.1 million on domains brokered by Moniker.